AncestorPuzzles.com: Genealogy Garage at the LA Public Library- Is Your Family in the Archives of the LAPL? Genealogy Garage at the LA Public Library- Is Your Family in the Archives of the LAPL? One of the biggest names in the genealogy world is the Southern California Genealogical Society. They are well known for their annual "Jamboree" held in "beautiful Downtown Burbank" and for their extensive genealogical library. What I did not know is that they have a partnership with the Los Angeles Public Library to offer the "Genealogy Garage." 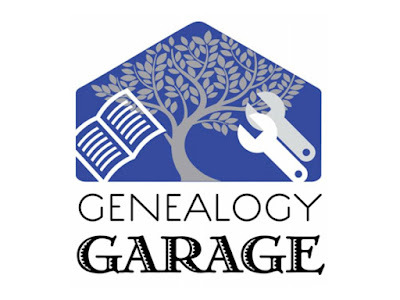 On the third Saturday of each month (except December), from 11 am-1 pm, SCGS and LAPL team up to offer the Genealogy Garage workshops at the Central Library of the LAPL. Whether you are a beginner or have been researching for years, here is an opportunity to "tune-up" your current research skills or learn something new about family history research. Since I was planning to be in LA on January 16, I signed up for the workshop entitled Genealogy Garage: Is Your Family In the LAPL Family History Archives? The usual Workshop leader Charlotte Bocage is the Education Chair for the Southern California Genealogical Society and is a veteran researcher in archives and libraries across the country. January 16 was an especially busy day for the LA genealogical community as the Genealogy Roadshow was being filmed at Union Station. Unfortunately, I did not get to meet Charlotte. The January 16 Genealogy Garage workshop was led by LAPL Genealogy Librarian Julie Huffman. Beyond the “open shelves & stacks” of the History & Genealogy Dept. at the LAPL is a trove of FAMILY HISTORY material available to the public IF YOU MAKE A REQUEST. These family histories were compiled & donated to the LAPL by other researchers. How do you request these family histories? Ms. Huffman found 11 matches in this index for my sample surname: Ketcham. Four of the matches were Ketcham family histories that will show up in an LAPL catalog search. LAPL also has a physical library card index which should also be consulted for family histories contributed before 1997. In addition, Ms. Huffman performed a search of PERSI which brought up 77 results. The History and Genealogy Department of the Los Angeles Public Library is on the Family Tree Magazine list of top 10 public libraries. The Genealogy Collection at Central Library numbers more than 40,000 volumes, including more than than 10,000 genealogies. The family name index to the collection is available through the databases link on the library home page or through the link in the preceding paragraph. There are over 200,000 volumes in the history book collection with especially strong collections in biography, travel, wars involving the United States, the West, Native Americans, and Los Angeles area history. I highly recommend a visit to History and Genealogy Department of the Los Angeles Public Library. Ms. Huffman was especially helpful and I thoroughly enjoyed her Genealogy Garage presentation. I also recommend that all genealogists visit the links to the SCGS and LAPL webpages that are found throughout this article. There are dozens of great ideas to use for your local genealogical society and your local public library.